Since the creation of IOV in March 2018 until now, the mission of IOV (Internet of Values) is simple: to enable to everyone a free, easy and equitable access to the economy of the digital assets. In an article written in May 2018, IOV details the main principles of interoperability between electronic wallets and blockchains in order to build the internet of value. 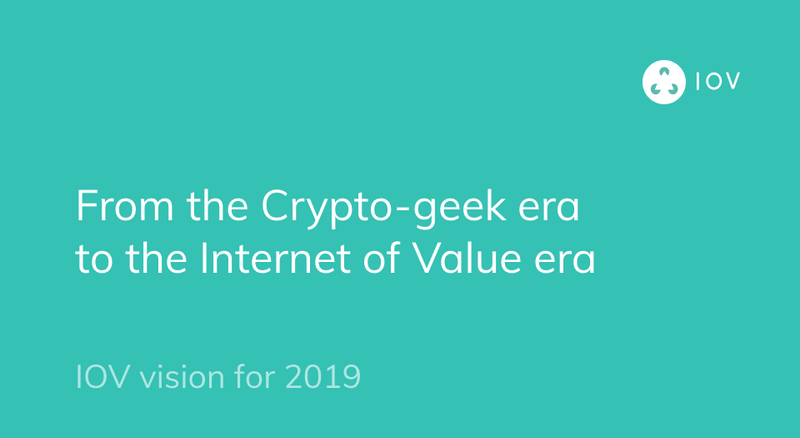 After spending the year of 2018 laying the foundation for interoperability and building both the BNS and the iov-core, here is a summary of the four major conditions that must be met so that we can move from the crypto-geek era to the era of the internet of value. Most internet users have an email to exchange information. IOV makes a prediction: users will soon have another human address called a “value address” that will allow them to exchange digital assets without an intermediary. To summarize, this is a universal bank account number without having to register with any bank. The human address of value thus makes the link between several cryptographic addresses belonging to different blockchains. Some transactions such as an atomic swap then become much easier: no need to know the different cryptographic addresses related to different blockchains to exchange two digital assets. IOV is not a precursor on this subject since there are other “blockchain name services” such as ENS. However, our approach is different since we have a multi-blockchain approach. We are also distinguished by our pricing because we believe that it is absolutely essential that this service can be free at the start so that a maximum of users understand the benefits of the human address of value. Being able to regenerate a private key is a necessary and essential condition for moving from the crypto-geek era to the internet of value (see this article). If it is not possible to regenerate your private key under certain conditions, most users will not use the blockchain. Indeed, 99.99% of Internet users are used to being able to regenerate their password when it comes to the Internet of information. The management of its identity is a sensitive issue and solutions exist such as the “shamir secret” or the “social recovery” to allow our digital assets not to be lost even if the private key is lost. In the same way that national currencies are the basis of today’s economic exchanges, the stable coins will be the basis of the exchanges in tomorrow’s Internet of Value. Today, it is the day-to-day work of central banks that help to avoid a massive appreciation or depreciation of the traditional currency in order to allow the economy to develop. Gradually, blockchains dedicated to stable coins are created and can fulfill the same role as traditional currencies in the field of digital assets such as MakerDao or e-money.com. Who would want to reveal all his financial transactions in front of everyone? When it comes to our private life, few currencies today respect this essential condition: a few examples include Z-cash, Grin or Beam (MimbleWimble). The underlying technology is recent and relies on the latest cryptographic discoveries. It is currently difficult to set it up and it does not yet solve all problems such as the possibility of proposing a light client. We can nevertheless anticipate that this condition will be fulfilled in the near future by some digital assets in the line of Z-cash or Grin.